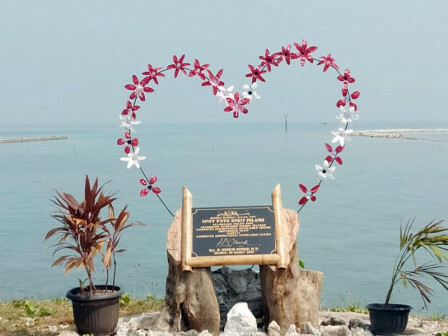 Pari Island Public Facility Maintenance Agency (PPSU) personnel together with local residents create a heart-shaped ornament to be a selfie spot in Bukit Pelangi, a new tourist destination in Lancang Besar Island, South Thousand Islands, that has been inaugurated by Thousand Islands Regency on April 11.
" We hope this ornament can attract more people to visit Bukit Pelangi"
Pari Island Urban Village Head, Sarjono mentioned, this location is actually known as one of the fishing destinations in Thousand Islands. Then his side together with the locals build this heart-shaped ornament as a selfie spot for visitors. It is using stirrup iron for its framework and decorated with beautiful hand-made flowers from plastic waste. "People can take a picture in here with beautiful sunset and sea as its background. We hope this ornament can attract more people to visit Bukit Pelangi," he said, Monday (4/15).